Receiver Royce Pollard scored the only touchdown of yesterday's Scout Bowl. With the usual headliners calling the plays, some of Hawaii's understudies got their moment in the spotlight. The Warriors held their annual Scout Bowl yesterday morning, which ended with senior quarterback Jake Santos connecting with freshman receiver Royce Pollard for a touchdown. "Everybody knew today was going to be a chance to get to play and have a good time and go live," Pollard said after making the diving catch in the end zone to cap the morning. "Being a receiver, I like to hit. I don't have a problem with hitting." The team's bye-week tradition capped the week of practice, as head coach Greg McMackin will give the players and staff the weekend off before returning to the field on Monday to prepare for their Western Athletic Conference opener against San Jose State next Saturday. "I thought the competition was really good and I thought the enthusiasm was outstanding," McMackin said. "It was fun, football should be fun." The Warrior regulars appeared to have as much fun as the scouts. Solomon Elimimian and John Estes co-coached the winning team past the squad led by Adam Leonard - who dressed the part, complete with headset and notepad - and Keala Watson. "Nothing on the line except pride," Leonard said after the scrimmage, "and mine's broken right now." 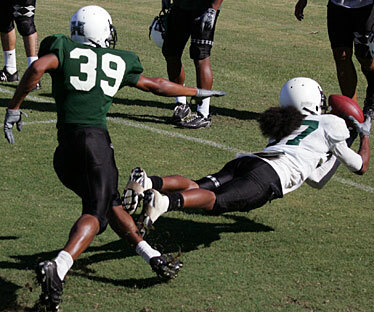 Then again, aesthetics aren't the main thrust of Hawaii's annual Scout Bowl. The Warriors closed their final practice of the bye week with the traditional scrimmage, giving the team's younger players and reserves a chance to play at full speed. "The scout team, they're really important to this team and they help us out so much, they give us great looks," said starting linebacker Solomon Elimimian, who co-coached the winning team with center John Estes. "Sometimes they might get overlooked, and I think today was just a good day to show what they can do. A lot of those guys have pride in what they do and they're a big part of this team." As for his demeanor toward fellow linebacker, roommate and coaching counterpart Adam Leonard, Elimimian wasn't quite so gracious after the scrimmage. "I'm going to let Adam hear about it all day," Elimimian said with a wide grin. The play in the half-hour scrimmage was generally ragged until senior quarterback Jake Santos and freshman receiver Royce Pollard led the lone touchdown drive of the morning. Facing third and 15, Santos hit Miah Ostrowski over the middle for 16 yards. Pollard then shook loose to turn a short completion into a 34-yard gain down the sideline. On third and goal from the 6, Santos looked for Pollard again. The throw was to the outside, forcing Pollard to twist around and make the catch just before hitting the ground. "It's exciting," Pollard said. "It's a moment everybody looks for, a chance to make a big play." "The pass really wasn't that great," said Santos, the first pick in Wednesday's draft. "The passes were kind of all over the place today, but it doesn't matter, as long as we got the W."
For one day, the orange jerseys didn't provide the quarterbacks much protection. In fact, redshirt freshman Shane Austin didn't bother, trading jerseys with starting receiver Greg Salas before the start of the scrimmage. Defensive back Richard Torres took advantage of the rare opportunity to hit the quarterbacks in practice, knocking the ball loose after Austin had scrambled for a first down. "It threw me off because he wasn't wearing orange," Torres said. "Someone grabbed him, so the coaches say the first one to get him, make the secure tackle, and the second guy strips the ball. So I just went for the ball." Torres was among the participants who are close to working their way onto the field when the games really count. Torres has been the second-team nickel back in practice and impressed the staff in kickoff coverage drills this week. "In practice we don't get to go full speed, so these are like a game for us to show that we can play," Torres said. The jovial mood was subdued for a few moments when running back Bryce Kalauokaaea was slow to get up after being twisted awkwardly while being pulled down from behind. But the former quarterback, who was attempting a halfback option pass, was able to walk off the field on his own. As they had in their first two practices of the bye week, the Warriors spent the first half of practice working on special teams and third-down conversions and installing the scouting report for next week's Western Athletic Conference opener against San Jose State. They'll take the weekend off and return to practice on Monday.